Nokia had just released the latest version of its mapping software, Nokia Maps, which it is planning to incorporate into its Ovi mobile Internet platform. In addition to a new user interface, the latest version offers more detailed nearby and category searches, including full city guides, improved GPS, as well as a data counter. Nokia planned to cover 150 countries with 50 of them navigable. Most of the basic route service is free. Nokia had also released a version of its Map Loader software for PC to upload the maps from the PC to your mobile phone. Definitely will save the heavy loading from the mobile network. Nokia claims that the mobile maps apps each have been downloaded one million times since its mapping service since it first went live in February. This has to be the most valuable service on Ovi now. 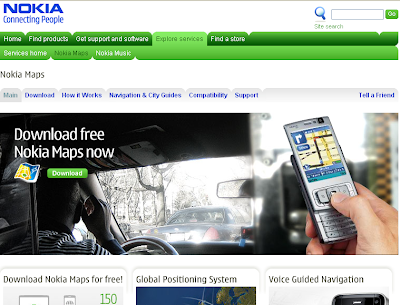 Do check out their site to download Nokia Maps to your mobile.